During the Synod, 3-28 October, Bishops and others gather to reflect on challenges that face young people 18-30 years of age. Many young migrants are tempted to leave their homeland seeking a better future. Our basic response to migrants, asylum seekers, refugees and the displaced. Peace is possible. Pope Francis says it is not enough to open our hearts to the suffering of others. Much more remains to be done before our brothers and sisters can once again live peacefully in a safe home. Join our mailing list so we can share important developments and together make the world a safer and more welcoming place for everyone. 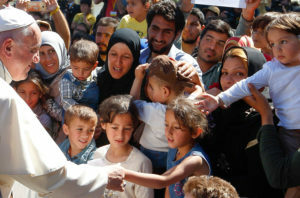 Pope Francis knows what asylum-seekers, migrants and refugees need. We should welcome and protect them, he says, we should promote and integrate them. To do all this, here are some resources you can use in your community or parish … plus some policies to advocate in your country and at the U.N. level. Many adults and children are victims of human trafficking for labor and sexual exploitation, organ trafficking, begging and forced delinquency. Migrants and refugees are among the groups most vulnerable to trafficking and exploitation, both during their journey and upon arrival in the destination countries. Pope Francis urges us to do everything we can to combat the shameful crime of human trafficking.